The DS is a great little gaming machine. It has a camera, two screens, Wi-fi and some clever built in tools. However, it is a gaming machine and without specialist software it’s pretty hard to squeeze any education use out of it. I’ve been lucky enough to get to try out this hardware as part of a MOLENET project in the UK which exploits mobile technlogy for education. I had 16 new DSi Nintendo machines to use with my English language and Maths students. In this blog I’ll talk about just one function of the DS – its ability to instantly connect with other machines around it. A great feature of the DS is that it can connect and chat with other DS machines – see the picture on the right. This is a lovely piece of built in software, you can type or draw something and then ‘send’ it to up to 15 DS machines that are logged into the same chatroom. This doesn’t require connection to the internet and has great potential to be exploited in the classroom. I gave my students a DSi each and asked them to go to the ‘sytem settings’ > page 2 > profile > username’. Here, they had to change the name of the device to their own name so everyone could see who wrote each entry. I didn’t allow nicknames unless this was a name that everyone used for this student. I then asked students to click on the box with a smiling face on the main menu ‘Chat’ and then choose ‘Chatroom A’. Everyone had to write ‘hello’ to show they were there. I also had my own DSi logged into the chatroom so I could follow what was happening, give feedback and also contribute if necessary. The first obvious use is spelling, ask a student to spell a word and they can instantly spell it and send it so you and the rest of the class. I tried this in my intermediate English class and asked them to spell twenty of the most commonly misspelt words in English – click here for this list. I’ve done lots of spelling tests but this was much more fun and students could get feedback on their answers straight away. There was also and element of pressure, everyone was able to see if you had spelt the word wrong and so, some weaker students waited till stronger ones had written the answers and the sent it to the group – they could then copy the answer as their own. This backfired on a couple of my students as one of the cleverest decided to write an incorrect spelling on purpose which they copied. I’ve used short answer questions in internet chatrooms as a computer lesson before – click here for the blog, so I used the same lesson here and asked students to write down answers to quick, kind of pithy questions like ‘When did you last cry? Why?’ ‘Who do you most admire?’ and ‘Tell me a lie about yourself.’ (which isn’t a question – but it asks for a response). I also asked some stupid questions like ‘What did you have for your breakfast?’ and ‘What animal would you be?’. These were designed to generate fun for the class but they also had a more serious side. I noticed that most students were desperate to answer quickly and with good answers that were correct and/or funny proably because the whole class could see their individual response. As well as generating written English the quiz also generated a great deal of talking, asking for clarification and also follow up comments on individual answers. Getting students to have conversations with each other on the DSi chatrooms seemed the logical next step. This time, I asked students to go to the ‘sytem settings’ > page 2 > profile > username’ and change the name of their machine to something that noone else would be able to guess – this could be ‘Student 1’ or ‘student 2’ or something more strange and memorable like ‘flower’ or ‘blue’. Importantly, they were not allowed to tell anyone their name. I then secretly put students into one of the four chatrooms on the DS by passing them pieces of paper with the letter of the chatroom they had to go. I have twelve people in my class and so there were three people in each chatroom. I gave students five minutes to chat to each other and guess who the other people were in the chatroom. Iasked them not to shout out their answer, but write the names of the people in the chatroom and their real life names on the paper I’d given them. This was a fun lesson as students asked each other questions, gave each other false answers and pretended to be someone else. Whilst there wasn’t any specific focus of the lesson, dexterity in English reading and writing (and speaking) was tested to its full capacity in a meaningful way. Everyone enjoyed the task and not everyone guess correctly the other people they were talking to. I aim to try this on a group of teachers and find out how they get on. I decided to spend a bit of time using this function with a very low level ESOL learners to practise not only reading and writing but also speaking. Both the student and I found this to be a very useful and rewarding way of teaching writing on many different levels. So much so that I feel this issue needs it’s own blog – click here to read this. I also decided to try using the DS to help my five year old son with his reading and writing – this deserves its own blog – click here to read it. 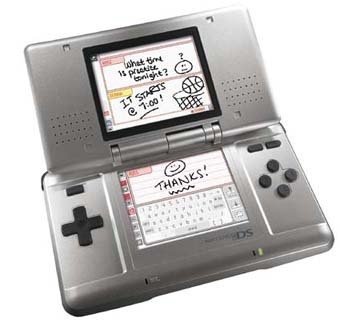 The chatroom is a real joy to use, as you write onto the DSi screen you can hear the soft sound of chalk onto board, the layout is clean and easy to use and although there aren’t any other colours to use apart from black and multi-coloured it’s got a real doodly feel to it. More able and younger students instantly fell into using it by trying out all the functions without asking questions, very much in the mold of Prensky’s digital natives and older as well as less able students tended to be slower. All of the groups I worked with enjoyed using the technology and it did help to make the classroom more dynamic and motivational. – As I said with the PSP, charging up 15 DSi machines is a pain. Also, the battery life is too short! – The classroom activities were very definitely a ‘once a month’ task. Students would quickly get bored of the chatroom function if it was used in the same way every lesson, however it does have a place in one to one or low level ESOL teaching where the benefits would be massive. – In group activities the strongest and most able are the studenst who have the most to say. Anyone who is slow might not be able to keep up and runs the risk of not being able to participate, however with the correct classroom management this could easily be avoided. – There doesn’t seem to be a way of keeping the comments made. It would be great to keep a word doc. of the things said and who said them. This would be particularly useful for the conversations lesson that I did. – There are only four chatrooms. I wanted to split my students into pairs and send one half of each pair into different rooms, they would have to use written English to communicate with each other. I have 15 students and there are only four chatrooms avaliable on the DS machine. Robin Hood Primary School in Wakefield are also using the DS to teach. Click here for their blog. Japanese schools using the Nintendo DS. Click here for the blog. Wow! This is amazing! My students would love this! I suppose the DS is considered more of a toy than a tool for the classroom. It is difficult to monitor the class to ensure that they are not playing games. It would be too much of a temptation for my students.